The late Adam West (Batman, that is) didn't just sear his portrayal of the Caped Crusader indelibly into the public psyche. 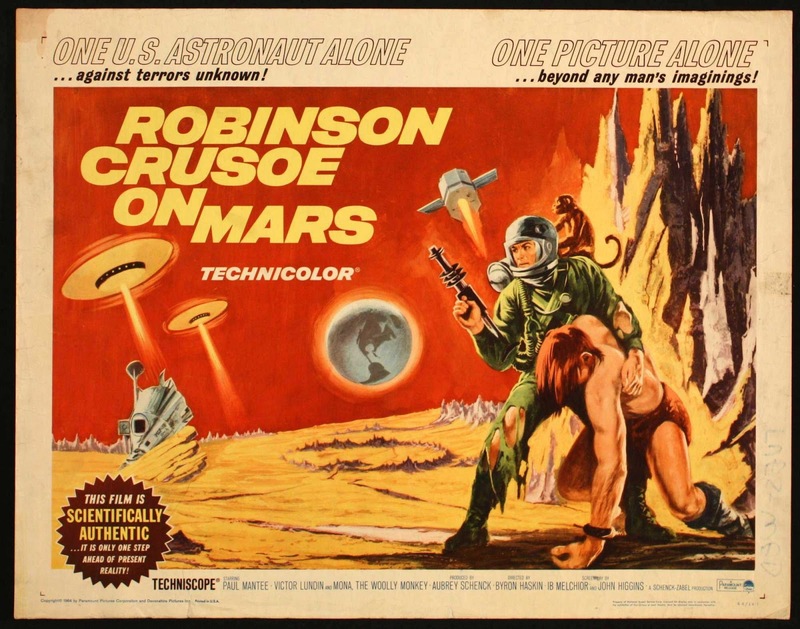 He was in a lot of other movies and TV shows, including one of my all-time favorites Robinson Crusoe on Mars. Unfortunately for culture, many people react to that title in much the same way as they do to Santa Claus Conquers the Martians, which, interestingly, came out the same year -- 1964. But this film is much better, getting a 94% on Rotten Tomatoes (Santa gets a measly 24%, FYI). 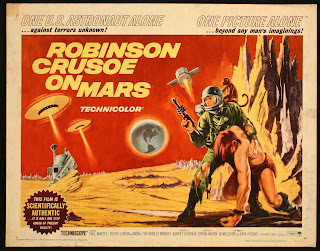 In fact Robinson Crusoe on Mars is good enough that it's included in the Criterion Collection of swanky films, which is no mean feat. Two astronauts, Dan McReady (Adam West) and Kit Draper (Paul Mantee), along with handy experimental subject Mona the Monkey (Barney the Woolly Monkey), crash land on Mars. Two of them survive but unfortunately neither one is Col. McReady, so West doesn't get a lot of face time in this movie. But he seems very astronaut-like (both actors do, actually) and is a ringer for Neil Armstrong, although he -- like Adam West -- wasn't famous yet. I notice that West's jaw muscles get very tight during scenes where he feeds Mona the Monkey and pulls her space helmet off. It makes me wonder if there was any actor/sharp-toothed monkey tension on the set. After burying their fellow astronaut, Kit and Mona head off into the rusty desert wilderness of Mars, doing their best to survive during adventures paralleling Robinson Crusoe's. 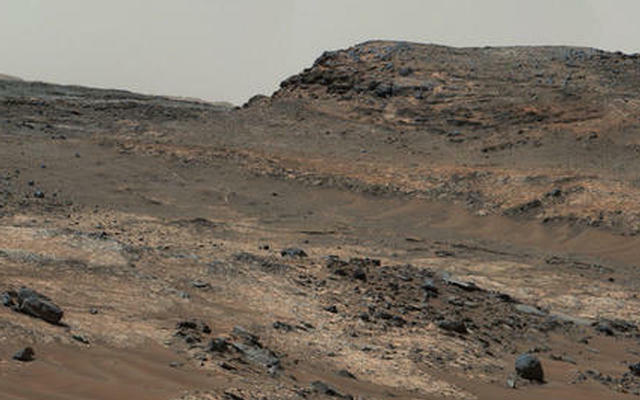 Given the science of the time, long before we had probes and rovers everywhere on Mars, the way they portrayed the Red Planet's environment is pretty good. Most of it was filmed at Zabriskie Point near Death Valley, and with a reddish tint added in post-production the landscape is remarkably similar to photos beamed back by the Curiosity rover. 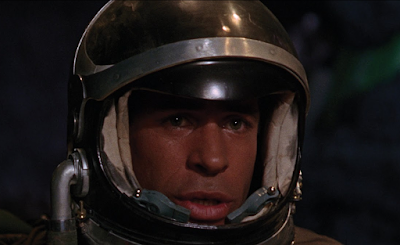 Few other movies of the time tried so hard to duplicate what science said Mars was like. Of course the rocks that burned like coal AND produced oxygen (one of Mona's insightful discoveries) were a stretch. And rescuing the alien slave Friday along with his supply of air pills was a happy accident. And by 1964 almost nobody thought Mars had canals filled with water anymore. And so on. But, as a bonus documentary the Criterion Collection includes on their DVD points out, Robinson Crusoe on Mars got a lot of things right, or at least as right as can be expected. A little over a year after this film debuted, Adam West would be rocketing to super-stardom as Batman. Meanwhile Paul Mantee, despite being the lead in Robinson Crusoe, never really got his "big break." Instead he did what Wikipedia articles on 2nd string actors frequently term "working steadily." This he did for decades before turning to writing in the late 1990s. As an interesting side note, he appeared in an episode of his former co-star's show playing a henchman of Catwoman who wears a Batman costume to frame him for a crime. Maybe Adam West threw a little work his way for old time's sake? Paul Mantee passed on in 2013. No word on the fate of Barney the Woolly Monkey.